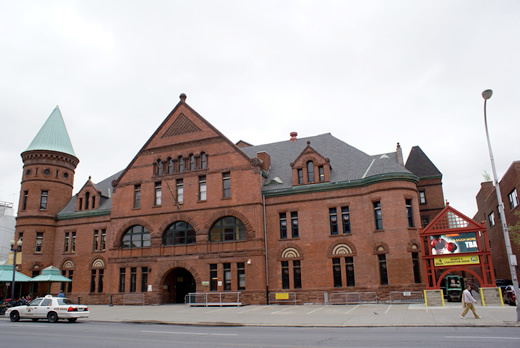 The Washington Avenue Armory is a multipurpose facility in downtown Albany that once housed the Tenth Battalion National Guard. In 1890 famous New York architect Isaac Perry designed the Washington Avenue Armory. The armory housed the Tenth Battalion National Guard as well as many events. Everything from Concerts to Basketball to Wrestling and Roller Derby have been, and continue to be, hosted in the Washington Avenue Armory. Sean Greene, “The Washington Avenue Armory,” Albany Walks for Health, accessed April 20, 2019, http://www.albanywalksforhealth.com/items/show/56. "About The Armory." The Armory. Accessed March 26, 2016. http://www.albanyarmory.com/about/. "Phil Jackson." Wikipedia. May 18, 2004. Accessed March 26, 2016. https://en.wikipedia.org/wiki/Phil_Jackson. "Washington Avenue Armory." Wikipedia. May 16, 2005. Accessed March 26, 2016. https://en.wikipedia.org/wiki/Washington_Avenue_Armory. "Albany Patroons." Wikipedia. March 1, 2005. Accessed March 26, 2016. https://en.wikipedia.org/wiki/Albany_Patroons#History. "Isaac G. Perry." Wikipedia. May 12, 2007. Accessed March 26, 2016. https://en.wikipedia.org/wiki/Isaac_G._Perry.